Page added in March 2018. The photos were taken in September 2017. Germany is a large country of Europe divided into several states and principalities which are united under one head distinguished by the title of Emperor. (..) The most received division of Germany is that which was made by the Emperor Maximilian I in 1512 into ten circles. (..) The circle of the Lower Rhine contains: 1) the palatinate of the Rhine (..) subject to the elector Palatine (..) 2) The archbishopric and electorate of Cologne (..) 3) The archbishopric and electorate of Mainz (..) 4) The archbishopric and electorate of Triers (..) 5) The bishopric of Worms (..) 6) The duchy of Simmeren subject to its own duke (..) 7) The counties of Falckenstein, Leiningen, Oberstein, Spanheim, Reiffenscheid, and Rovenau subject to their own counts and the county of Meurs subject to Prussia. Thomas Nugent - The Grand Tour: A Journey Through the Netherlands, Germany, Italy and France 1756. This excerpt shows what a mosaic of states made up Germany in the XVIIIth century. In total there were some 300 states in the ten circles. 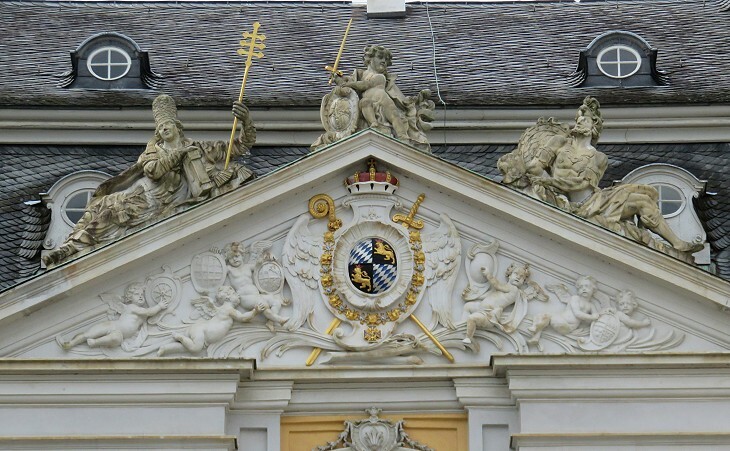 Since 1440 the Electors always chose the Habsburg Archduke of Austria as the new Holy Roman Emperor, with just one exception in 1742, during the Austrian Succession War, when the Prince-Elector of Bavaria managed to be elected Emperor Charles VII. Cologne itself was a Free Imperial City and the archbishops were usually not allowed to enter it. 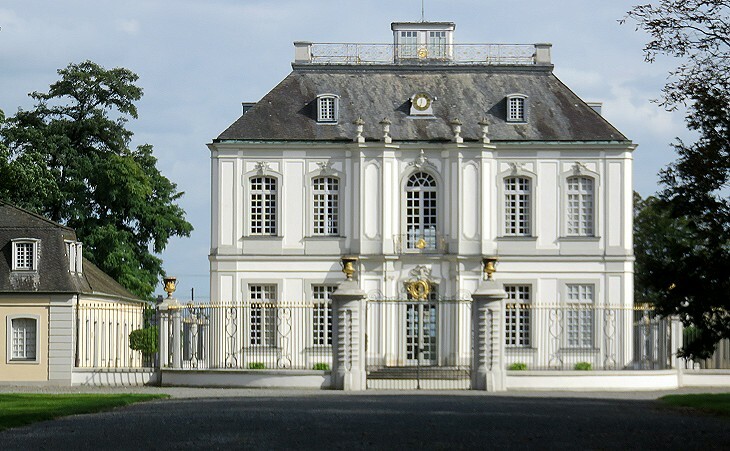 The construction of Clement Augustus' countryside palace near Bruhl began in 1725, based on plans by Johann Conrad Schlaun who was soon replaced by François de Cuvilliés, court architect of the Prince-Elector of Bavaria at Munich. 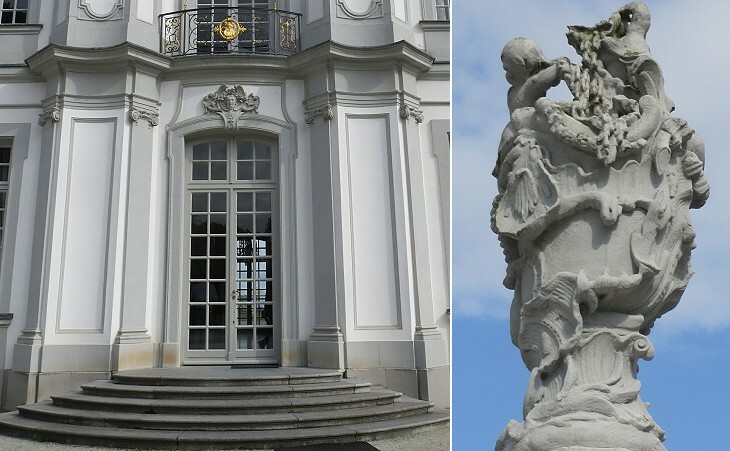 At Augustusburg, the staircase of Balthasar Neumann - considered a work of creative genius - is a rapturous structure which unites a lively movement of marble and stucco, jasper columns and caryatids, and culminates in the astonishing frescoed ceiling of Carlo Carlone. From the 1984 UNESCO Brief Synthesis of the Universal Value of the palace. 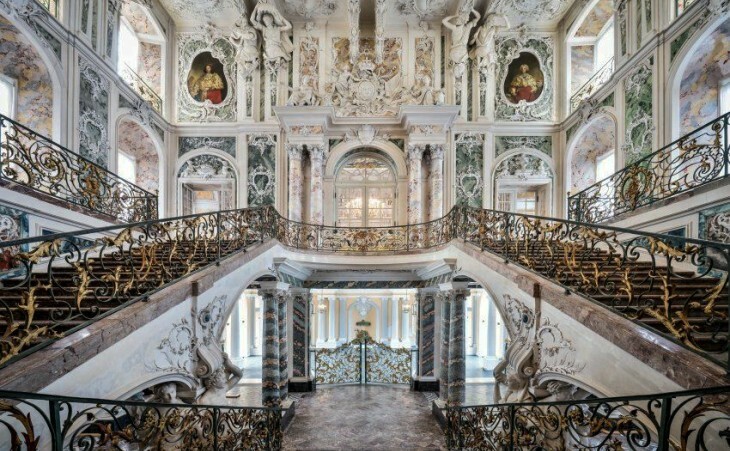 The staircase is a 1743 addition by Balthasar Neumann, an architect best known for having designed the palace of the Prince-Bishops of Würzburg. You may wish to see the grand staircase designed by Luigi Vanvitelli at Caserta a few years later. 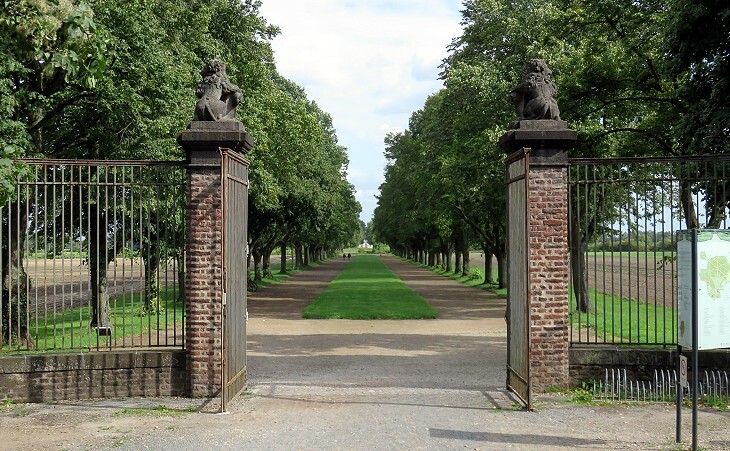 The formal gardens were designed by Dominique Girard, a pupil of André Le Nôtre, who created those at Versailles. 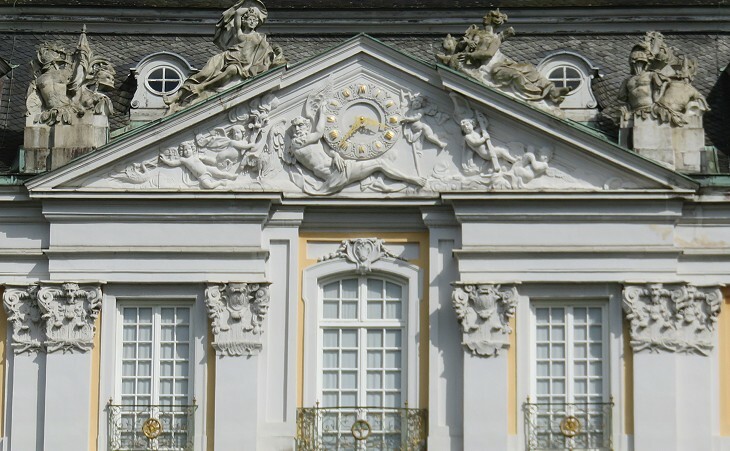 Because the ground surrounding the palace is flat he could not add the waterfalls which characterize other similar mansions (see those at Caserta and La Granja di San Ildefonso near Segovia). William V, Duke of Bavaria fought on the Catholic side during the religious wars which tore apart Germany in the XVIth century. 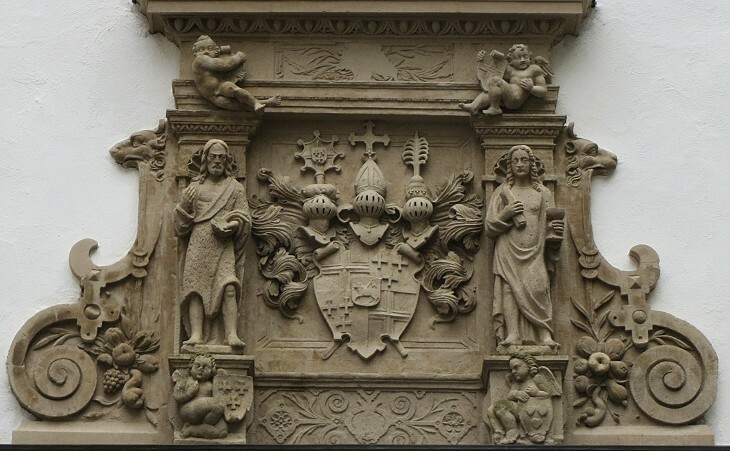 By doing this in 1583 he secured the Archbishopric of Cologne for his brother Ernest and more in general for a member of his family (Wittelsbach). For this reason Clement Augustus did not need to become highly proficient in theology or to conduct a particularly pious lifestyle. He belonged to one of the noblest family of Germany and he enjoyed hunting, the preferred pastime of his class. He could not marry, but he did not need to hide having a mistress and his daughter married Franz Ludwig von Holnstein, the illegitimate son of Charles VII, his brother. 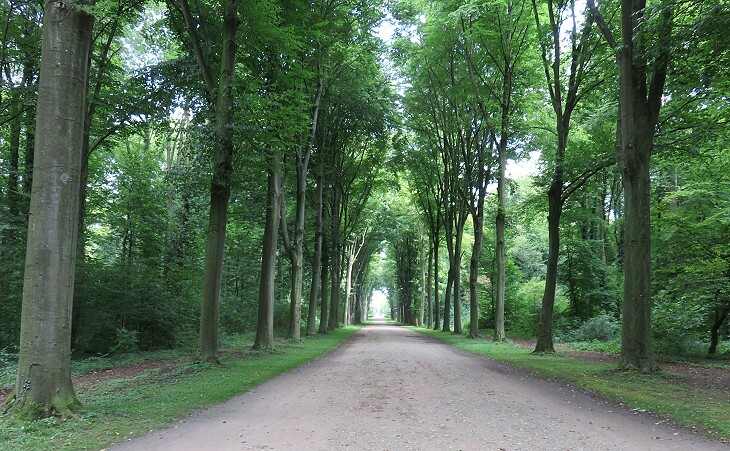 The Bruhl estate included a woodland which was within easy reach from the palace, but Clement Augustus chose to entrust François de Cuvilliés with the construction of a hunting lodge, where he and his fellow hunters could rest. The site was selected taking into account the flight path of the herons, the favourite prey in falconry. Caserta, Wednesday, March 14, 1787. The new palace appears to me, however, particularly gloomy; and no one of us could bring himself to think the vast and empty rooms comfortable. The King probably is of the same opinion, for he has caused a house to be built on the mountains, which, smaller and more proportioned to man's littleness, is intended for a hunting-box and country-seat. The comment made by Goethe could apply to Clement Augustus too. In 1794 French troops occupied Bonn and Cologne which were formally annexed to France in 1801. In 1815 at the Congress of Vienna, the states of the Archbishop-Electors of Cologne, Trier and Mainz were assigned to the Kingdom of Prussia. 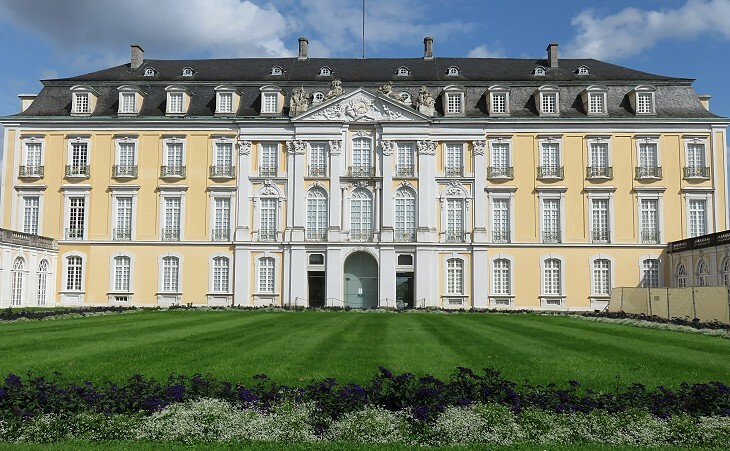 Schloss Augustusburg was badly damaged during the final phase of WWII. Efforts to restore it to its previous splendour had already begun by 1946. From 1949 to 1996 it was used as an official representative palace by the state. Elaborate receptions were held by the President of West Germany to greet foreign dignitaries. 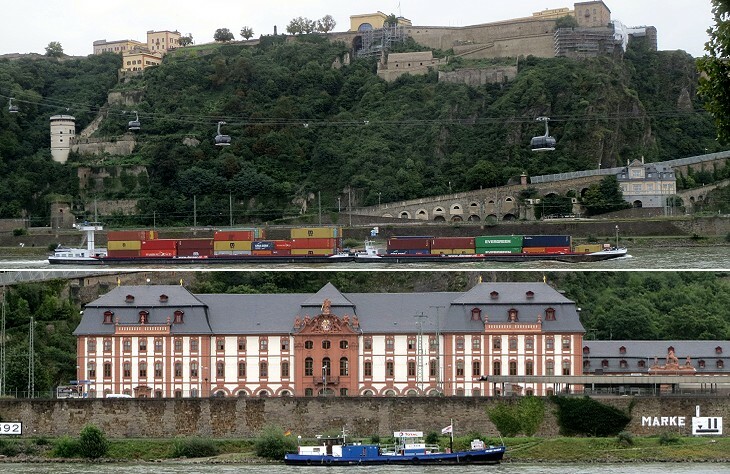 In the XVIIth century Archbishop-Elector Philip von Soetern built a series of palaces at the foot of the castle. 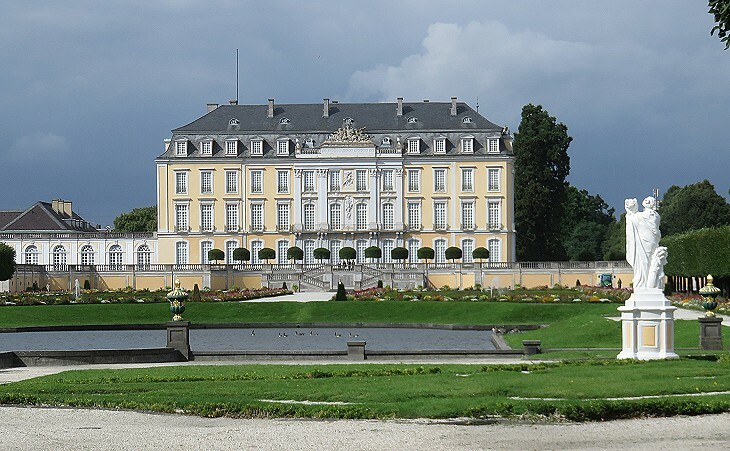 They were improved and redesigned by Balthasar Neumann in 1739-49, but in 1801 the French blew up the castle and most of the palaces. Trier, the ancient Augusta Treverorum was the capital of Gallia Belgica, a Roman province along the left bank of the Rhine. 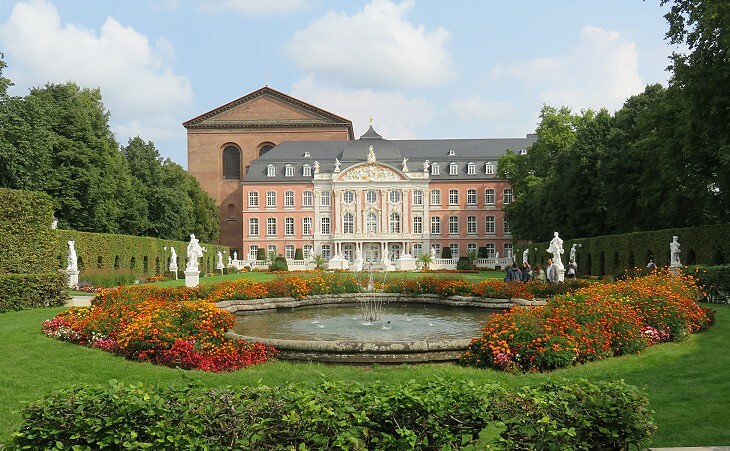 In the early IVth century and before becoming the sole ruler of the Empire, Constantine set his residence at Trier and built a palace which included a large basilica which was used as an audience hall. In the following centuries the palace was abandoned and eventually parts of it were turned into the residence of the Archbishop-Elector. 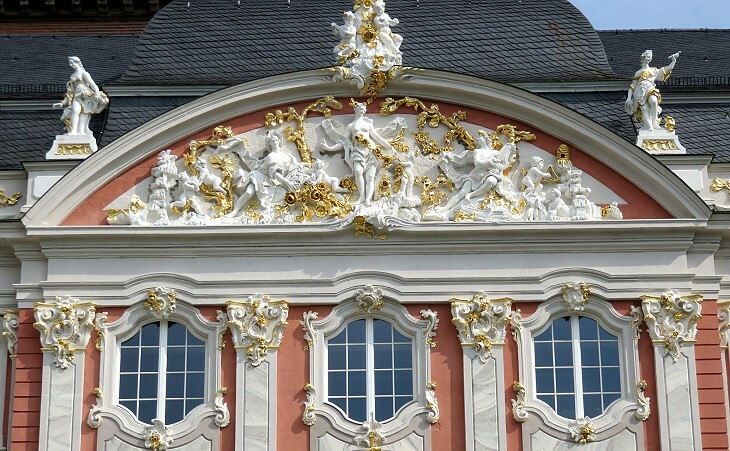 In 1756 Archbishop-Elector Johann Philipp von Walderdorff decided to improve his residence at Trier. He assigned the task to Johannes Seiz, a pupil of Balthasar Neumann. 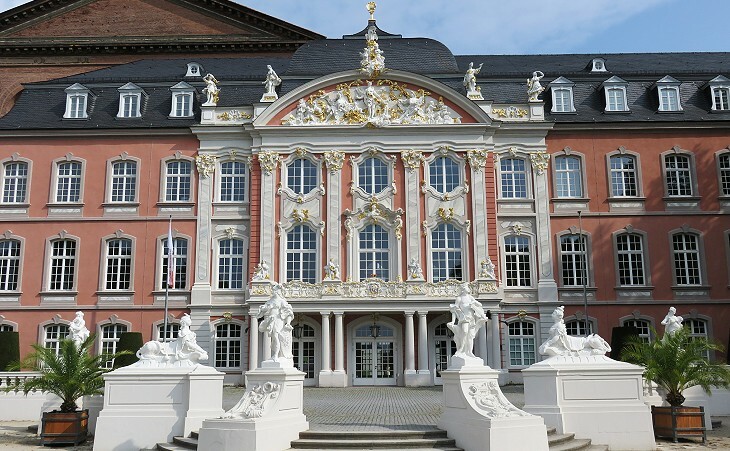 In 1794 the new very elaborate palace was turned into a barracks by the French and it continued to be used for the same purpose by the Prussians after 1815. Its gardens became a training ground for the troops. It was bombed during WWII. The reconstruction of the palace and the design of new gardens were completed in 1955.